Based on a USD price of $1,195.00 and today's exchange rate. Imagine a world where you use your phone or tablet seamlessly to talk, text, access the internet and your apps, independently of cellular and fixed networks. Well that world is very nearly here with the imminent arrival of IsatHub, our global smart device connectivity service. Inmarsat iSavi WiFi Satellite HotSpot + Free Shipping!!! The iSavi is lightweight, highly portable and quick and easy to set up with no technical expertise or training needed. The power consumption is low and the battery can be recharged with the included AC/DC adapter or optional car charger or solar power. Simply point the iSavi towards one of Inmarsat's global constellation of I-4 to access IsatHub. Pointing assistance is delivered via the intuitive pointing lights on the terminal along with a Control app downloaded onto your smart device, which offers other administrative features to manage service connectivity. The Inmarsat-4 3G satellite network provides global coverage meaning you can take the iSavi anywhere to seamlessly use your smart device. Once connected, the iSavi will become a Wi-Fi access point for any authorized smart devices within 30 meters (100 feet). 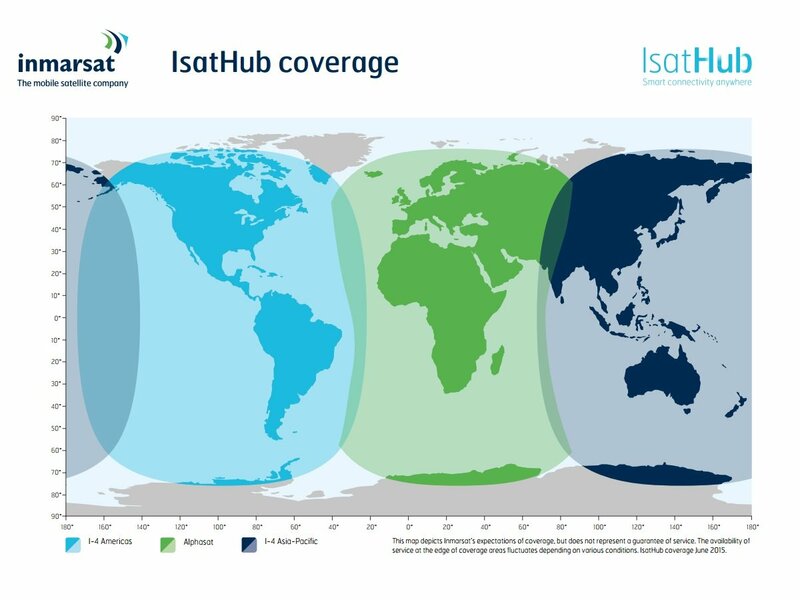 Because IsatHub is delivered over Inmarsat's 3G network, your device can use its high-quality dedicated voice line to send and receive voice calls as well as text messages, even if your device is only Wi-Fi enabled. 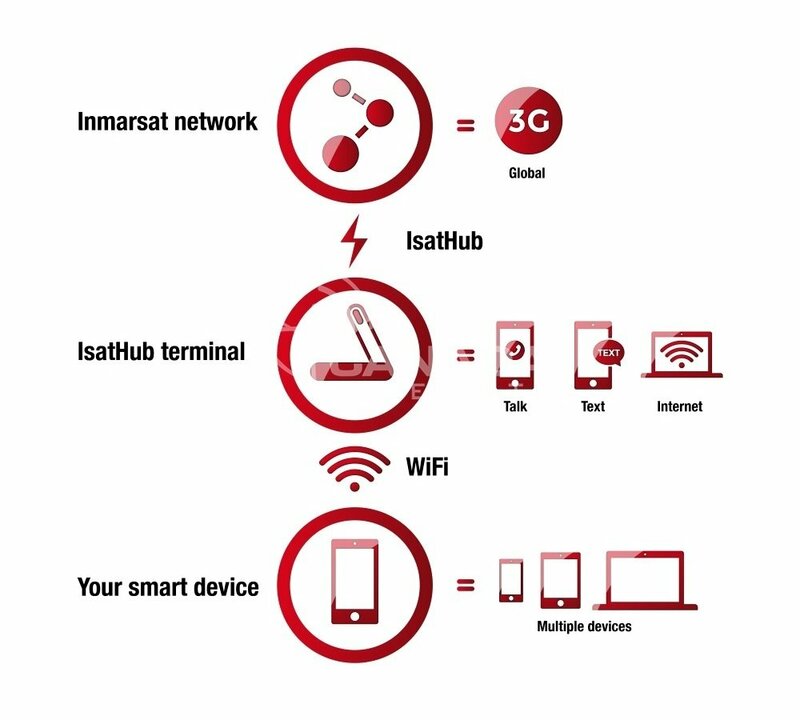 With international numbers provided by Inmarsats IsatHub service there will be no roaming charges, therefore, the cost of using the iSavi can be significantly less than using your 3G/4G mobile phone or tablet when roaming away from your home area. Imagine a world where you use your phone or tablet seamlessly to talk, text, access the internet and your apps, independently of cellular and fixed networks. Well that world is very nearly here with the imminent arrival of IsatHub, our global smart device connectivity service. So now you can remain productive by having a constant line back to the office and stay in touch with your friends and family wherever you go. The IsatHub service is accessed from your iPhone, iPad and/or iPod touch or Android[TM] device through the control app. This provides set-up assistance and gives you full control over access to the service as well as visibility of data usage from each device sharing the IsatHub connection. The voice app enables you to use your smart device to send and receive voice calls via IsatHub's dedicated high-quality voice line, as well as text messages, even if your device is for WiFi use only. - Dependable Smartphone/Tablet-to-Satellite connectivity - Voice, Data and Text (all at the same time). - Power consumption is low and the battery can be recharged by an AC power adaptor/car charger adaptor/Sherpa 50 rechargeable powerpack or by a suitable solar panel. This map depicts Inmarsat's expectation of coverage, but does not represent a guarantee of service. The availability of service at the edge of coverage areas fluctuates depending on various conditions. Isathub coverage June 2015. Can I use iSavi™ in the rain? The iSavi™ has the ingress protection rating of IP65, which means it is protected from dust ingress and low pressure water jets from any direction. However, while charging, you need to protect the terminal from rain or water contact.